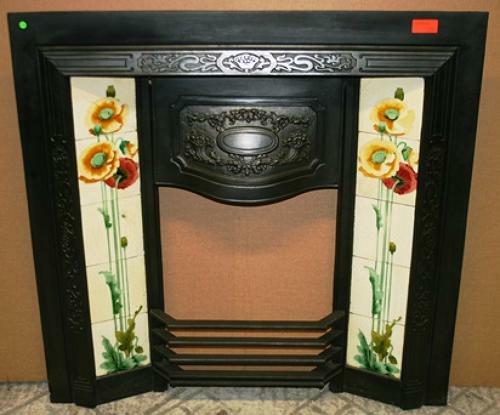 A very pretty, Art Nouveau, tiled fire with decorative smoke hood and poppy design. The fire has 5 decorative tiles on each side that fit together to make a lovely poppy scene. The fire has a large, serpentine, decorative smoke hood and the crossbar and legs have borders typical of the Art Nouveau style. The fire insert is heavy and well made and is the perfect size and design for a living or dining room. We can supply a fire brick and fire stool to fit for an EXTRA £95. Please let us know if you would like to purchase the brick and stool. The fire is an antique, c.1904 and although it is in good, solid condition, there are some signs of wear and some slight damage. The tile enamel has heavy cracking and there are some breaks and small chips to several tiles. There is a gap on either side of the smoke hood and there are some slight marks and scratches to the fire. The back has surface rust as expected. The fire is a very pretty example of Art Nouveau design and would add great character to a home.